It was a lovely day on the water. A gentle breeze, a calm, deep blue sea with just a slight ripple – a perfect day for scanning the horizon for dolphins. And lo and behold, we caught sight of a mega-pod of spinner dolphins and were soon busy with data sheets, camera, hydrophone, stopwatch and all that jazz. We got back to shore satisfied with our day on the water. At the docking site, our fisher friends were emptying their catches from their gill-net and hook-line fishing boats. I stopped short when I noticed the largest mobulid I had ever seen, and then the largest sharks I had ever seen too. A whole school of thresher sharks, about 11 of them, an almost equal number of males and females, and each one two metres or more long. I was bewildered. I frowned. It stayed with me. The pain of seeing beauty dead. The wonder at their presence. Questions about why these adult males and females were hanging out together. As often happens, thoughts that stick lead somewhere. Later in the year I was asked to attend a discussion on banning the practice of shark finning in India. As I prepared for the meeting, I was intrigued by how little we know about sharks in India – their diversity, ecology and life history – or about shark fisheries. At the time, CITES 2013 made a recommendation to the Indian government to list four species of elasmobranchs and manta rays under Appendix II, and Humane Society International proposed a ‘Fins Attached Policy’ recommendation to the Ministry of Environment, Forest and Climate Change. The project with the SOSF came about as a result of these two recommendations. I needed to know more before I could jump on any bandwagon. I hold a PhD degree from James Cook University, Australia. My thesis focused on Irrawaddy dolphins and my research interests cover the areas of conservation, biology and behavioural ecology. I have been working as an independent ecologist in India and am currently involved in four projects on marine mammal ecology and conservation. I am interested in studying human–animal interactions in urban and wild areas, and in projects that require local community involvement in conservation. 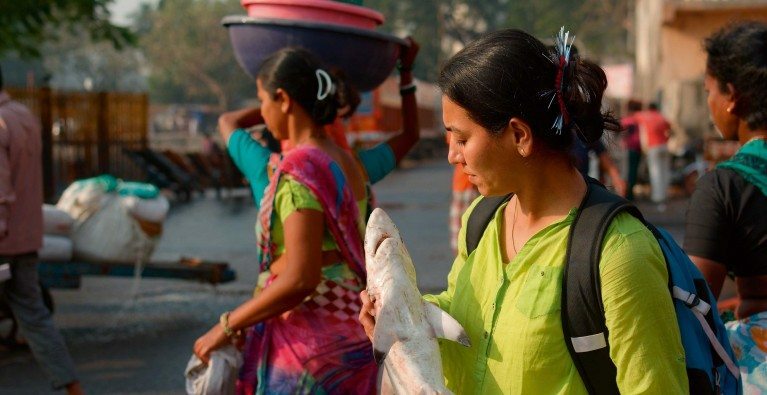 Sharks represent new research territory for me, but working in fishing communities provides a perfect opportunity to explore the relationship between people and the natural world.